Last year, CEO Robert Toll – who runs the luxury home construction firm Toll brothers - took home a staggering $21.8 million pay package. This extraordinary amount also included a performance related $17.5 million bonus. If only the Robert Toll could inflate the share price as fast as his compensation. 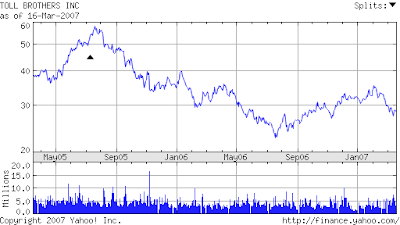 Since the summer of 2005, the share price has fallen from around $60 to under $30 (see the chart above). So as the shareholders have become poorer, Bob “the Builder” Toll has been pulling out the cash from the company.